The Hawaiian race of Black-necked Stilt (Himantopus mexicanus knudseni) nests at the refuge; the black around the neck and face extend farther than on mainland birds, according to Hawaii Audubon Society. Hawaiian Coot (Fulica alai) used to be considered a subspecies of American Coot (F. americana) but was "split" in 1993 and received full species status from American Ornithologists' Union. At the refuge, construction plans include a 7,500-square-foot building to be used as a visitor center and refuge office, an exhibit hall, a multi-purpose room, a reception area and a lobby/bookstore. The facilities will replace the current single-wide mobile trailer used by refuge staff. At Oregon Zoo's Jonsson Center for Wildlife Conservation, the big birds are busy. As of last week, keepers found six fertile eggs in the critically endangered species' nests. 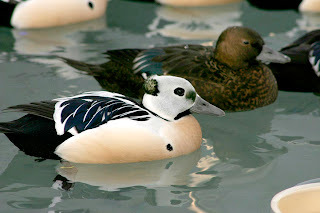 "This year's breeding season is off to a great start," said Shawn St. Michael, Oregon Zoo curator of birds. "The eggs look healthy, and the parents are doing a great job so far of incubating and nesting." 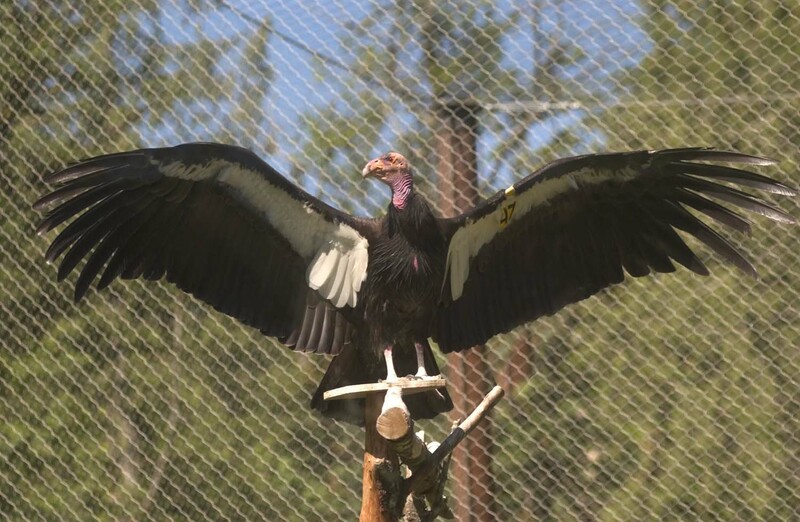 Because of captive-breeding programs like the one at Oregon Zoo, condors in captivity and in the wild now number more than 330. In 1982, only 22 condors lived in the wild. Cornell Lab of Ornithology's NestWatch seeks citizen scientists for its annual nest-monitoring program. Anyone who finds an active nest can participate by logging in or creating an account on the NestWatch site, becoming certified online, making notes about the birds' nesting activities and sharing the data via the "My Nests" page. 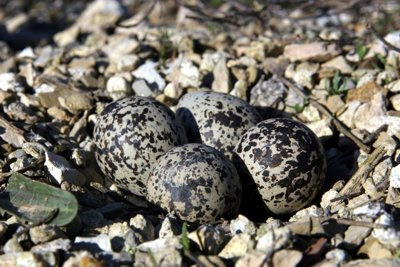 The site includes gobs of information, such as downloads that cover a code of conduct, a project manual and quick guides to "focal species" as well as tips about helping nesting birds and details about the protocol for monitoring nests. Why should someone spend time checking a nest every four days and entering data online? “Collecting this information across the continent over long periods of time is one of the best ways we have to detect widespread changes in bird breeding biology,” says Laura Burkholder, NestWatch project leader. 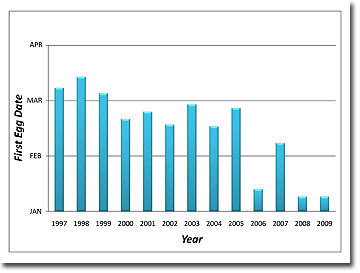 For instance, NestWatch data from 1997 to 2009 shows that Eastern Bluebirds might be laying their first eggs sooner (above). More long-term data from citizen-science projects like NestWatch can clarify the effects of environmental change and human land use on breeding birds. Among various awards announced recently by U.S. Fish & Wildlife Service, the Rachel Carson honors went to an individual and a group who created innovative conservation models and ways to manage bird populations. The awards recognize FWS employees "for significant contributions expanding knowledge in the scientific, conservation and wildlife management fields," according to a press release. The recipients also receive $50,000 to support their continuing efforts. Dr. John Tirpak, a wildlife biologist in Vicksburg, Miss., received the individual award for his focus on landscape, or large-scale, conservation planning and management of winering waterfowl. BPHA’s work over the years has contributed significantly to numerous scientific and technical achievements in the management of waterfowl and other migratory birds, successes that have been widely recognized throughout the wildlife research and management communities. Want to help your flock safely fly long distances while looking for food, water, shelter and space? Click on Mission: Migration to accept the challenge and see how birds travel during spring and fall migrations. Players will help the flock dodge storms and airplanes, catch jet streams and fly faster or slower. They also will choose landing sites when the flock runs out of energy. Kudos to the designers for choosing to feature a young woman as the birder who introduces the animated game! Unfortunately, the pop-up screen wasn't adjustable in size, the text appeared in a small font, and the symbols in the farmland landing zone were too small to read as hazards; the game could be better but illustrates some great concepts. communications, Bob Marshall with New Orleans, La., Times-Picayune and Field & Stream. Many birders around the country enjoy birding at the Bolsa Chica wetlands in Huntington Beach, Calif. If you're one of them, you might like to see the latest issue of The Tern Tide, published by Amigos de Bolsa Chica. Among the latest items in the Tide: details about the Junior Naturalists Program, a new Bolsa Chica Wetlands lapel pin, a look at Belding's Savannah Sparrow (Passerculus sandwichensis beldingi), and news of the recent dedication ceremony of the footbridge. Who cut the ribbon during the ceremony? A young girl who asked that, instead of birthday gifts, her family donate to the fundraising efforts for the bridge. What a cutie. Communities in the East recently began participating in Flying WILD, a program from the Council for Environmental Education. The new partners include Bowling Green, Ky. (Western Kentucky University's Center for Environmental Education and Sustainability); Fort Wayne, Ind. (Science Central); Glen Rose, Texas (Fossil Rim Wildlife Center); Murfeesboro, Tenn. (Discovery Center at Murfee Spring); Newark, N.J. (Newark Museum); and Point Pleasant Beach, N.J. (Jenkinson's Aquarium). Flying WILD focuses on three goals: using birds to teach core curriculum, providing teachers with educational tools and partnerships, and expanding International Migratory Bird Day celebrations. This year, IMBD falls on May 8; it typically occurs on the second Saturday of May. Flying WILD's city partners include 27 other communities around the United States and in Canada. You can look for a local event here. The U.S. 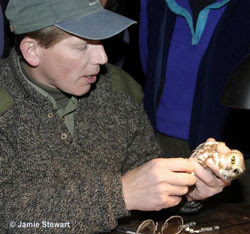 Fish & Wildlife Service recently announced the 18 recipients of the 2009 Endangered Species Recovery Champion awards. The program salutes FWS employees and their partners who've helped the recovery of threatened and endangered species in the United States. Of the 18 awards, five are affiliated with programs that help birds. Those species include light-footed Clapper Rail (top right), Spectacled Eider, Steller’s Eider (middle right), Piping Plover (bottom right), Whooping Crane and Brown Pelican. The 2009 recipients include FWS employees and their partners: universities, conservation agencies and private organizations. Their successful efforts focus on habitat restoration, public awareness campaigns and species’ monitoring programs. Brown Pelicans benefited from Audubon Texas' Coastal Sanctuary Program, while Whooping Cranes increased in numbers thanks to Dr. George Archibald and the International Crane Foundation staff. The number of Piping Plovers in Cape May, N.J., tripled because of U. S. Army Corps of Engineers in Philadelphia, while Spectacled Eider and Steller's Eider recovered largely because of Debbie Nigro of the U. S. Bureau of Land Management in Fairbanks, Alaska. 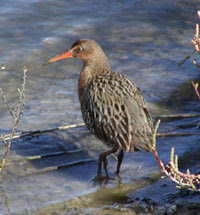 Dr. Richard Zembal of Orange County Water District in Fountain Valley, Calif., led efforts on behalf of light-footed Clapper Rails. More details about the recipients and their programs appear here. Many thanks to them for their work on behalf of threatened and endangered birds! National Audubon Society recently announced the four honorees at this year's Women in Conservation Luncheon. At the May 18 event at The Plaza in New York, Audubon will present the Rachel Carson Award to Fernanda Kellogg, Suzanne Lewis, Isabella Rossellini and Dr. Beth Stevens. 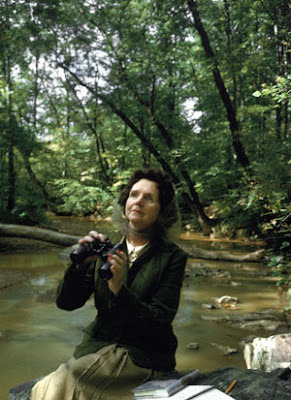 Audubon launched the Rachel Carson Award in 2004 to recognize visionary women whose dedication, talent and energy have advanced conservation and environmental education locally and on a global scale. The award is named for Rachel Carson, whose landmark book "Silent Spring" opened the world's eyes to the damage inflicted by the indiscriminate use of pesticides such as DDT. Before Congress, Rachel Carson's testimony called for an environmental regulatory department, which came to life several years later with the establishment of the Environmental Protection Agency. Since its inception, the award has raised over $1,000,000 in support of Audubon's campaign to protect the Long Island Sound and Audubon's Women in Conservation Program, which includes a website to educate women on important environmental issues and the ongoing efforts that address them and an internship program for girls and young women hoping to gain exposure to the environmental nonprofit world. Since 2004, Fernanda Kellogg has served as president of The Tiffany & Co. Foundation, which provides grants to nonprofit organizations working globally in the environment and design and the decorative arts. As superintendent of Yellowstone National Park, Suzanne Lewis manages more than 2.2 million acres, a staff of 400 and the largest operating budget of any national park. As senior vice president of environmental affairs, Dr. Beth Stevens leads the environmental efforts for The Walt Disney Company, which includes developing and facilitating the company's strategy and policy including aggressive environmental goals announced in 2009. Although Greater Sage-Grouse will not receive protection under the Endangered Species Act as quickly as some advocates desire, it will benefit from an initiative recently announced by U.S. Department of Agriculture's National Resources Conservation Service. With funds from two voluntary conservation programs -- Environmental Quality Incentives Program and Wildlife Habitat Incentive Program -- ranchers and farmers can conserve the sage-grouses' sagebrush habitat. “Thanks to this NRCS program support, ranch communities will be able devote more resources to sagebrush habitat recovery as well as initiate new cooperative habitat revitalization efforts,” said Leo Barthelmess, a rancher in Malta, Montana, and founding member of Ranchers Stewardship Alliance, which works collaboratively with agencies, private landowners, non-governmental organizations and many other partners to conserve sage-grouse habitat across a 1 million-acre landscape in eastern Montana. 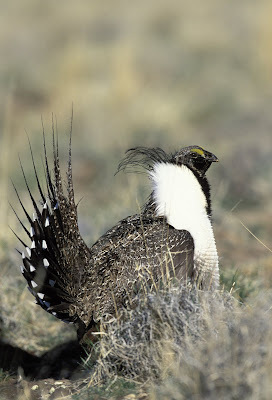 sage-grouse populations have declined from an estimated 320,000 males in 1965-1970 to less than 90,000 males on just over 5,000 communal stomping grounds called “leks” in the western United States, as of 2007. Greater sage-grouse currently occur in only 11 western states: California, Colorado, Idaho, Montana, Nevada, North Dakota, Oregon, South Dakota, Utah, Washington and Wyoming. The Migratory Bird Conservation Commission recently approved more than $19 million in grants to protect and restore more than 135,000 acres of wetlands and wildlife habitat in the United States and Mexico. The Commission awarded the grants under the North American Wetlands Conservation Act. The Commission also approved more than $800,000 to add more than 1,350 wetland acres to two units of the National Wildlife Refuge System. These acquisitions include 1,315 acres to provide habitat for waterfowl at San Bernard National Wildlife Refuge in Matagorda County, Texas; and 38 acres of habitat at North Central Valley Wildlife Management Area in Butte County, California. 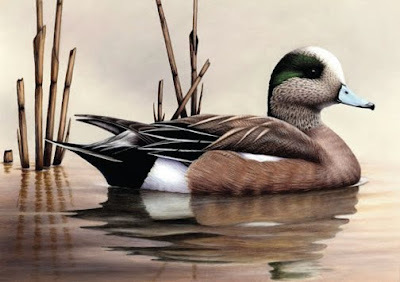 Funds for the refuge acquisitions come from import duties collected on arms and ammunition and sales of the Migratory Bird Hunting and Conservation Stamp, otherwise known as the Federal Duck Stamp (above, the 2010 stamp - American Wigeon). The stamp features the winner of the annual Federal Duck Stamp Art Contest. At Mill Grove -- the first American home of French artist, naturalist and author John James Audubon -- birder and Pulitzer Prize-nominated author Scott Weidensaul will receive the first John James Audubon Center Award for Art Inspiring Conservation. His work will be honored at Friends of a Feather, a gala reception at the facility in Audubon, Pa. Weidensaul's most recent book, "Of a Feather: A brief history of American birding," debuted in September 2007. Sponsored by Audubon Center at Mill Grove, the award seeks to honor an artist who conveys the value of nature, interprets conservation challenges and inspires action to protect birds and other wildlife. “John James Audubon used a brush to transform how Americans look at nature; Scott Weidensaul uses words to the same magical effect,” said Jean Bochnowski, director of the center. Scott Weidensaul does more than write about birds. As a federal licensed bird-bander, he leads teams from the Ned Smith Center for Nature and Art (Millersburg, PA) to harmlessly catch, band and release hundreds of Saw-Whet Owls each fall. Much of what is now known about the migratory patterns of these tiny and elusive raptors comes from the work of Mr. Weidensaul and hundreds of other volunteer researchers. Tickets for the gala reception begin at $65; contact the center at 610-666-5593 x105 or millgrove@audubon.org. In Texas' Shelby County, a Bald Eagle will regain its freedom today near Lake Timpson. After nearly six months of recovery and rehabilitation, the raptor will leave Last Chance Forever Bird Conservancy in San Antonio, where it regained its health after being shot in September 2009. Authorities continue to offer a $2,500 reward for information that will lead to an arrest in the shooting. Although no longer on the federal Endangered Species List, Bald Eagles remain federally protected. Texas Parks & Wildlife Department game wardens are working with the U.S. Fish and Wildlife Service in the criminal investigation. Anyone with information is asked to call USFW: 281-876-1520. 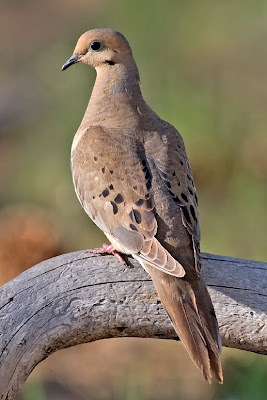 The California Department of Fish & Game seeks volunteers to complete a two-hour training course before trapping and banding Mourning Doves as part of a national study. Participants in the Mourning Dove Banding Program need to be 18 years old or with a guardian and have good organizational skills. Volunteers will not pay a fee and can participate from the comfort of their homes between June and August. CDFG will provide all supplies after the volunteers complete the training and receive a legal bird handling permit. The trapping and banding work usually occurs in the early morning (dawn to 10 a.m.) and the late evening (5 p.m. to dusk). Volunteers can work limited hours or only on certain days, and they can place traps almost anywhere, including their own yards. Traps must be checked within every hour it is set to avoid predation and summer heat exposure. When a Mourning Dove is trapped, a volunteer will band its right leg, record the band number data and release it. The trapping season will end on Aug. 20, and all traps must be pulled by that date. CDFG will need all materials shipped immediately to the office at 1812 9th St., Sacramento 95814, for database entry. 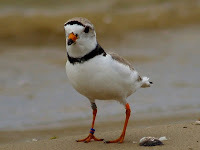 All band recovery data is reported to the U.S. Geological Survey Bird Banding Laboratory, where it is added to the national database. Wildlife managers use this information to keep track of the species’ survival and harvest rates. UPDATE: For more information about the program or to reserve a space at a training session, contact Heather Hlusak at hhlusak@dfg.ca.gov, 916-445-3445, or Karen Fothergill at kfotherg@dfg.ca.gov. Congratulations to Seabrooke Leckie of The Marvelous in Nature! She won this month's First Friday fiction contest, making her a two-time winner. Now she gets to choose a prize from these books: "Bird" by Andrew Zuckerman, "The Season of the Robin" by Don Grussing, "Waterbirds" by Theodore Cross and "Bright Wings" by Billy Collins and David Allen Sibley. You have the chance to win a recently published birding book if you enter the April contest! Mark April 1 (no joke!) on your calendar as the deadline for your fictional story about birds, birders or birding. * The story contains no more than 500 words. Now, the winning entry in March's First Friday: "Distraction." Ben sat at his desk in his cubicle, one hand on his mouse, the other propping up his chin as he looked wistfully out the windows on the other side of the aisle. They looked out over the parking lot to undeveloped shrubby land beyond. In the distance was the broad blue ribbon of the river. He liked to look toward it, imagining that he was walking the riverside trail with his binocular around his neck. It was one of those beautiful June days, where the sun was shining, the birds were singing, and the temperature was neither too hot nor too cold. He didn't mind his desk job during the winter months, and in the heat of mid-summer, he appreciated being in the air-conditioned environment, but on perfect days like this, he sometimes wished he worked outdoors. He found it hard to focus on what he was doing and his productivity dropped right off on nice days. He was staring out the window when Janet, a coworker who sat on the other side of the cubicle wall from him, returned from her lunch break. She dropped her stuff on her desk and immediately peered over the top of the wall. She looked distraught. "Ben, I think I hit a bird!" she wailed. "Where? On the road? Well, they do tend to fly across at the last minute, it's not always possible to-"
"No! Here in the parking lot. I got out of my car, and there was this bird flopping around on the ground. I didn't know what to do! Do you think you could come look at it?" She didn't have to ask Ben twice -- any excuse to get outside. He knew of a rehabber ten minutes away they could take the bird to if needed. He followed Janet out to the parking lot. There was a conference today, and the lot was unusually full. She'd had to park at the far side, where the paved lot gave way to a band of gravel and melted in to the shrubby field beyond. There was a small bush right by her car, and he wondered if maybe a kingbird had been flycatching. They were half a dozen meters from the car when there was a sudden explosion of movement from the gravel edging. A brown-and-white bird, about the size of a robin, dashed onto the pavement in front of them and started flopping around wildly, looking indeed like its wing was broken. "Is that the bird?" Ben had trouble suppressing a laugh. "Yes! That's it! Can you help?" He walked to the gravel and took a quick look around. Sure enough, perfectly camouflaged among the stones were four speckled eggs. "One of those 'Wet Floor' tripods and a laminated sign ought to do the trick," he said to a confused Janet. He pointed out the eggs and, on the way back to the building, told her all about Killdeer. Rainforest Alliance certified farms gained an international customer this year, with the Tetley brand promising to purchase all tea for its branded teabag and loose tea products from the certified farms. The alliance said the the world's second largest tea company plans to complete the switch by 2016. All farms that are Rainforest Alliance Certified™ have met the environmental, social, and economic standards of the Sustainable Agriculture Network. The SAN standards cover ecosystem conservation, worker rights and safety, wildlife protection, water and soil conservation, agrochemical reduction, decent housing, and legal wages and contracts for workers. A new 32-page report proves that individuals and small groups can make big changes that benefit the environment, says Restore America's Estuaries. "Hope for Coastal Habitats: People Partnerships, and Projects Making a Difference" focuses on projects that created dramatic differences in restoring endangered and degraded watersheds around the country. "'Hope for Coastal Habitats' sheds new light on the old adage that people should think globally and act locally," said Jeff Benoit, president and CEO. While the problems facing our coasts and estuaries are daunting and often demand big technological and governmental fixes, change is possible with participation by individuals, groups, cities, and townships working together. "The central message of "Hope for Coastal Habitats" is that change comes from the bottom up and that we are all responsible for helping it come about," Benoit said. Research, reporting and production were handled by North Carolina Coastal Federation, an RAE member organization. Funding was provided by the National Oceanic and Atmospheric Administration. Founded in 1995, Restore America's Estuaries is a national alliance of conservation organizations dedicated to preserving our nation's estuaries. RAE members include: the American Littoral Society, Chesapeake Bay Foundation, Conservation Law Foundation, Coalition to Restore Coastal Louisiana, Galveston Bay Foundation, North Carolina Coastal Federation, People for Puget Sound, Save The Bay-Narragansett Bay, Save The Bay-San Francisco, Save The Sound-a program of the Connecticut Fund for the Environment, and Tampa Bay Watch. West of Los Angeles, another success story unfolds. Although largely gone from the Channel Islands for decades, Bald Eagles have rebounded, including K10 and K26 on Santa Cruz Island. The pair recently returned to their nest in Pelican Harbor, and K26 laid an egg last week. You can watch a 7-minute video of her laying the egg. Both adults will incubate it for about 35 days. You can read weekly updates and watch the Eagle Cam, located close enough to see the raptors blink. To learn more about the Bald Eagle's history on the islands and their reintroduction, visit The Nature Conservancy. For the first time in 61 years, the Federal Duck Stamp Art Contest will occur in the West next October. The U.S. Fish & Wildlife Service recently announced that the David Brower Center in Berkeley, Calif., will host the two-day judging event for an annual contest that draws hundreds of entries. “Having this prestigious contest in the heart of the urban Bay Area provides a unique opportunity to introduce new, non-traditional audiences to the importance of wetlands and wildlife conservation,” said Ren Lohoefener, regional director of the service’s Pacific Southwest Region. With the event open to the public, authorities from the art, waterfowl and philatelic communities will judge the art. The winning entry will appear on the Federal Duck Stamp, also known as the Federal Migratory Bird Hunting and Conservation Stamp, and the winning artist will receive a pane of stamps bearing his or her design. All waterfowl hunters age 16 and older are required to purchase and carry a current Federal Duck Stamp. In addition to hunters, conservationists, recreational birders, stamp collectors and others also purchase the $15 stamp in support of habitat conservation for a wide diversity of species. Ninety-eight percent of the proceeds from stamp sales go to the Migratory Bird Conservation Fund, which supports the purchase of wetlands for inclusion into the National Wildlife Refuge System. About 1.8 million stamps are sold each year nationwide. Twenty refuges in the Pacific Southwest Region have directly benefitted from the sale of Federal Duck Stamps. The 2009 Federal Duck Stamp Contest winner -- Robert Bealle of Waldorf, Md. -- will see the stamp bearing his American Wigeon (above) go on sale on June 25. Details about the 2010 contest appear here, and the entry deadline is Aug. 15. March 1 brought the first Falcon Flash newsletter of the year, focusing on the Peregrine Falcons in Cleveland, Ohio. The newsletter is part of the Raptors in the City curriculum. Since 1991, the 12th floor of "Tower City" has hosted a nestbox, and for many years, SW (the female) and Buckeye (the male) raised and fledged young while being monitored in person and via webcam. It is with great sadness we report that Buckeye, the male peregrine falcon at this nestsite for the past 12 years, died on November 17, 2009, from injuries that appear to have been caused by a fatal head injury, probably due to collision with a building. Buckeye was the father of 34 peregrine chicks. He made a wonderful contribution to the future of the species peregrine falcon, which has been recovering from near extinction in the U.S. since the 1970s. Mr. Harvey Webster of the Cleveland Museum of Natural History suspects that Buckeye's fatal collision might have come during a battle with another male. Buckeye was getting up in years at age 14 and may have been challenged for SW's affections and control of valuable nesting territory. Peregrine falcons are fierce predators, and both males and females will battle to the death over nesting territory and mates. A new male, identified as Ranger because of his leg bands, has courted SW, and observers say the falcons appear to have bonded. Because Ranger is young, having hatched in 2008, questions come up: Is he mature enough to be a father? Will he know how to hunt well enough to provide for his family? We'll find out soon. You can sign up for Falcon Flash here. Words and birds go together, which the vast collection of birding books -- not field guides but other genres -- confirms. Not too long ago, the majority of birding books fit into the nonfiction category, but that began to change recently. We can see birders and birds more often in fiction, such as mysteries and drama. * You submit a 500-word fictional story about birds, birders or birding. * You send your tale to wildbirdATbowtieinc.com before 5 p.m. PST on the first Thursday of the month, and you include your mailing address. The author of the winning entry gets to receive a recently published book, such as Andrew Zuckerman's "Bird" or Don Grussing's "The Seasons of the Robin." You'll find the previous winners' tales in the sidebar to the right. Will you join the contest this week and earn a spot in the sidebar? Prizes for only 250 words! 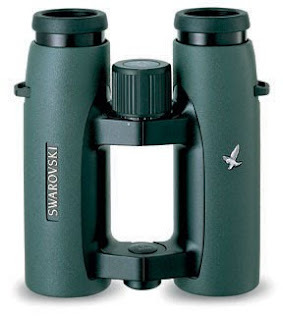 Want to receive a new Peterson field guide, some Swarovski swag and the chance to win a hosted birding trip and a Swarovski binocular? Then open your March/April issue to pages 11 and 21, look at the Forum Focus and Backyard Inquiry questions, and send your 250-word responses today! Sometimes we hear complaints about the deadline: "Why would the deadline that appears in the March/April issue be on March 1?" Answer: The vast majority of readers receive their copies in the mail, and the subscription copies of the March/April issue were mailed on Jan. 20, which gave subscribers more than four weeks to read the issue and send their Arduous or Nest replies. Interested in more details about the contest? Look at the sidebar to the right, find the section about the Birder of the Year program, and consider if you want to win a Swarovski binocular and a hosted birding trip. Maybe you'll visit Costa Rica, like Connie Kogler did.